Some time ago I found myself conceptually provisioning ESXi hosts that could transition local storage in a distributed manner within an array of hypervisors. The architectural model likens itself to an amorphous cluster of servers which share a common VM client service that self provisions shared storage to it’s parent hypervisor or even other external hypervisiors. This concept originally became a reality in one of my earlier blog entries named Provisioning Disaster Recovery with ZFS, iSCSI and VMware. With this previous success of a DR scope we can now explore more adventurous applications of storage encapsulation and further coin the phrase of “rampent layering violations of storage provisioning” thanks to Jeff Bonwick, Jim Moore and many other brilliant creative minds behind the ZFS storage technology advancements. One of the main barriers of success for this concept was the serious issue of circular latency from within the self provisioning storage VM. What this commonly means is we have a long wait cycle for the storage VM to ready the requested storage since it must wait for the hypervisior to schedule access to the raw storage blocks for the virtualized shared target which then will re-provision it to other VM’s. This issue is acceptable for a DR application but it’s a major show stopper for applications that require normal performance levels. This major issue now has a solution with the introduction of Intel’s VT-d technology. VT-d allows us to accelerate storage I/O functionality directly inside a VM served by a VMware based ESX and ESXi hypervisors. VMware has leveraged Intel’s VT-d technology on ESXi 4.x (AMD I/O Virtualization Technology (IOMMU) is also supported) as part of the named feature VMDirectPath. This feature now allows us to insert high speed devices inside a VM which can now host a device that operates at the hardware speed of the PCI Bus and that my friend allows virtualized ZFS storage provisioning VMs to dramatically reduce or eliminate the hypervisor’s circular latency issue. Very exciting indeed, so lets leverage a visual diagram of this amorphous server cluster concept to better capture what this envisioning actually entails. The concept depicted here sets a multipoint NFS share strategy. Each ESXi host provisions it’s own NFS share from it’s local storage which can be accessed by any of the other hosts including itself. Additionally each encapsulated storage VM incorporates ZFS replication to a neighboring storage VM in a ring pattern thus allowing for crash based recovery in the event of a host failure. Each ESXi instance hosts a DDRdrive X1 PCIe Card which is presented to it’s storage VM over VT-d and VMDirectPath aka. PCI Pass Through. When managed via vCenter this solution allows us to svMotion VM’s across the cluster allowing rolling upgrades or hardware servicing. The ZFS replication cycle works as a background ZFS send receive script process that incrementally updates the target storage VM. One very useful feature of ZFS send receive capability is the include ZFS properties flag -p. When this flag is used any NFS share properties that are defined using “sharenfs= ” will be sent the the target host. Thus the only required action to enable access to the replicated NFS share is to add it as an NFS storage target on our ESXi host. Of course we would also need to stop replication if we wish to use the backup or clone it to a new share for testing. Testing the backup without cloning will result in a modified ZFS target file system and this could force a complete ZFS resend of the file system in some cases. Within this architecture our storage VM is built with OpenSolaris snv_134 thus we have the ability to engage in ZFS deduplication. This not only improves the storage capacity it also grants improved performance when we allocate sufficient memory to the storage VM. ZFS Arc caching needs only to cache these dedup block hits once which accelerates all depup access requests. For example if this cluster served a Virtual Desktop Environment (VDI) we would see all the OS file allocation blocks enter into the ZFS Arc cache and thus all VMs that reference the same OS file blocks would be cache accelerated. Dedup also grants a benefit with ZFS replication with the use of the ZFS send -D flag. This flag instructs ZFS send to the stream in dedup format and this dramatically reduces replication bandwidth and time consumption in a VMware environment. With VT-d we now have the ability to add a non-volatile disk device as a dedicated ZIL accelerator commonly called a SLOG or Separate Intent Log. In this proof of concept architecture I have defined the DDRdrive X1 as a SLOG disk over VMware VMDirectPath to our storage VM. This was a challenge to accomplish as VT-d is just emerging and has many unknown behaviors with system PCI BUS timing and IRQ handling. Coaxing VT-d to work correctly proved to be the most technically difficult component of this proof of concept, however success is at hand using a reasonably cost effective ASUS motherboard in my home lab environment. Let’s begin with the configuration of VT-d and VMware VMDirectPath. VT-d requires system BIOS support and this function is available on the ASUS P6X58D series of motherboards. 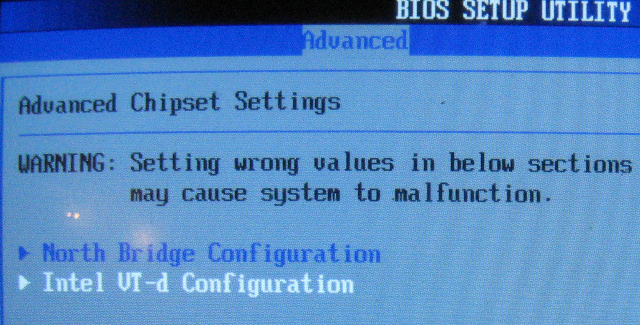 The feature is not enabled by default you must change it in BIOS. I have found that enabling VT-d does impact how ESXi behaves, for example some local storage devices that were available prior to enabling VT-d may not be accessible after enabling it and could result in messages like “cannot retrieve extended partition information”. 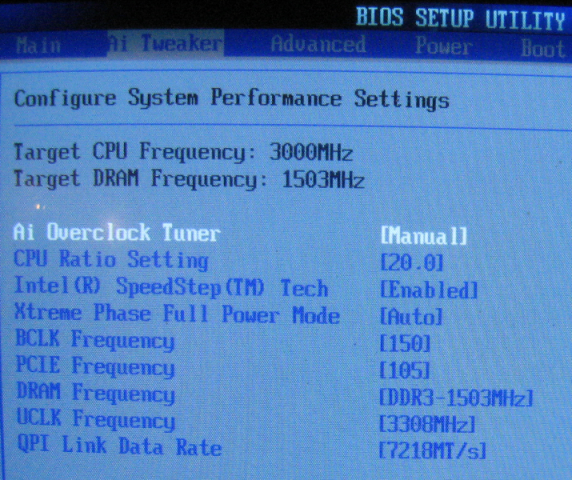 The following screen shots demonstrate where you would find the VT-d BIOS setting on the P6X58D mobo. Thanks go to Stu Radnidge over at http://vinternals.com/ for the screen shot! Once VT-d or IOMMU is enabled ESXi VMDirectPath can be enabled from the VMware vSphere client host configuration-> advanced menu and will require a reboot to complete any further PCI sharing configurations. One challenge I encountered was PCIe BUS timing issues, fortunately the ASUS P6X58D overclocking capability grants us the ability to align our clock timing on the PCIe BUS by tuning the frequency and voltage and thus I was able to stabilize the PCIe interface running on the DDRdrive X1. Here are original values I used that worked. Since that time I have pushed the i7 CPU to 4.0Ghz, but that can be risky since you need to up the CPU and DRAM voltages so I will leave the safe values for public consumption. Once VT-d is active you will be able to edit the enumerated PCI device list check boxes and allow pass through for the device of your choice. There are three important PCI values to note. The device ID, Vendor ID and the Class ID of which you can Google it or take this short cut http://www.pcidatabase.com/ and discover who owns the device and what class it belongs to. In this case I needed to ID the DDRdrive X1 and I know by the class ID 0100 that it is a SCSI device. Once our DDRdrive X1 device is added to the encapsulated OpenSolaris VM it’s shared IRQ mode will need to be adjusted such that no other IRQ’s are chained to it. This is adjusted by adding a custom VM config parameter named pciPassthru0.msiEnabled and setting its value to false. In this proof of concept the storage VM is assigned 4Gb of memory which is reasonable for non-deduped storage. If you plan to dedup the storage I would suggest significantly more memory to allow the block hash table to be held in memory, this is important for performance and is also needed if you have to delete a ZFS file system. The amount will vary depending on the total storage provisioned. I would rough estimate about 8GB of memory for each 1TB of used storage. As well we have two network interfaces of which one will provision the storage traffic only. Keep in mind that dedup is still developing and should be heavily tested, you should expect some issues. If you have read my previous blog entry Running ZFS Over NFS as a VMware Store you will find the next section to be very similar. This is essentially many of the same steps but excludes aggregation and IPMP capability. Using a basic OpenSolaris Indiana completed install we can proceed to configure a shared NFS store so let’s begin with the IP interface. We don’t need a complex network configuration for this storage VM and therefore we will just setup simple static IP interfaces, one to manage the OpenSolaris storage VM and one to provision the NFS store. Remember that you should normally separate storage networks from other network types from both a management and security perspective. OpenSolaris will default to a dynamic network service configuration named nwam, this needs to be disabled and the physical:default service enabled. To persistently configure the interfaces we can store the IP address in the local hosts file. The file will be referenced by the physical:default service to define the network IP address of the interfaces when the service starts up. Edit /etc/hosts to have the following host entries. As an option if you don’t normally use vi you can install nano. When an OpenSolaris host starts up the physical:default service will reference the /etc directory and match any plumbed network device to a file which contains the interface name a prefix of “hostname” and an extension using the interface name. For example in this VM we have defined two Intel e1000 interfaces which will be plumbed using the following commands. Once plumbed these network devices will be enumerated by the physical:default service and if a file exists in the /etc directory named hostname.e1000g0 the service will use the content of this file to configure this interface in the format that ifconfig uses. Here we have created the file using echo, the “uss1.esan.data1″ name will be looked up in the hosts file and maps to IP 10.1.0.1, the network mask and broadcast will be assigned as specified. One important note: if your /etc/hostname.e1000g0 file has blank lines you may find that persistence fails on any interface after the blank line, thus no blank in the file sanity check would be advised. One important requirement is the default gateway or route. Here we will assign a default route to network 10.0.0.1 which is the management network. also we need to add a route for network 10.1.0.0. using the following commands. Normally the routing function will dynamically assign the route for 10.1.0.0 so assigning a static one will ensure that no undesired discovered gateways are found and used which may cause poor performance. When using NFS I prefer provisioning name resolution as a additional layer of access control. If we use names to define NFS shares and clients we can externally validate the incoming IP with a static file or DNS based name lookup. An OpenSolaris NFS implementation inherently grants this methodology. When a client IP requests access to an NFS share we can define a forward lookup to ensure the IP maps to a name which is granted access to the targeted share. We can simply define the desired FQDNs against the NFS shares. In small configurations static files are acceptable as is in the case here. For large host farms the use of a DNS service instance would ease the admin cycle. You would just have to be careful that your cached TimeToLive (TTL) value is greater that 2 hours thus preventing excessive name resolution traffic. The TTL value will control how long the name is cached and this prevents constant external DNS lookups. Enabling DNS will require the configuration of our /etc/resolv.conf file which defines our name servers and namespace. You can also use the static /etc/hosts file to define any resolvable name to IP mapping, which is my preferred method but since were are using ESXi I will use DNS to ease the administration cycle and avoid the unsupported console hack of ESXi. It is now necessary to define a zpool using our VT-d enabled PCI DDRdrive X1 and VMDK. The VMDK can be located on any suitable VT-d compatible adapter. 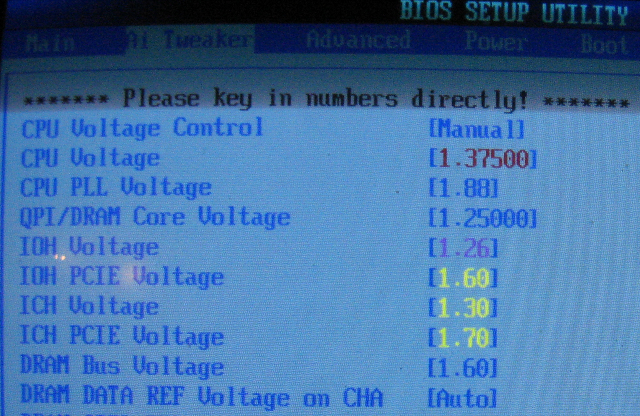 There is a good change that some HBA devices will not work with VT-d correctly with your system BIOS. As a tip I suggest you use a USB disk to provision the ESXi installation as it almost always works and is easy to backup and transfer to other hardware. In this POC I used a 500GB SATA disk attached over an ICH10 AHCI interface. Obviously there are other better performing disk subsystems available, however this is a POC and not for production consumption. To establish the zpool we need to ID the PCI to CxTxDx device mappings, there are two ways that I am aware to find these names. You can ream the output of the prtconf -v command and look for disk instances and dev_links or do it the easy way and use the format command like the following. With a functional IP interface and ZFS pool complete you can define the NFS share and ZFS file system. Always define NFS properties using ZFS set sharenfs=, the share parameters will store as part of the ZFS file system which is ideal for a system failure recovery or ZFS relocation. To connect a VMware ESXi host to this NFS store(s) we need to define a vmkernel network interface which I like to name eSAN-Interface1. This interface should only connect to the storage network vSwitch. The management network and VM network should be on another separate vSwitch. Since we are encapsulating the storage VM on the same server we also need to connect the VM to the storage interface over a VM network port group as show above. At this point we have all the base NFS services ready, we can now connect our ESXi host to the newly defined NAS storage target. Thus we now have an Encapsulated NFS storage VM provisioning an NFS share to it’s parent hypervisor. Here’ s the result of using dedup within the encapsulated storage VM. And here’s a look at what’s it’s serving. Incredibly the IO performance is simply jaw dropping fast, here we are observing a grueling 100% random read load at 512 bytes per request. Yes that’s correct we are reaching 40,420 IOs per second. Even more incredible is the IO performance with a 100% random write load at 512 bytes per request. it’s simply unbelievable seeing 38491 IOs per second inside a VM which is served from a peer VM all on the same hypervisor. With a successfully configured and operational NFS share provisioned the next logical task is to define and automate the replication of this share and any others shares we may we to add to a neighboring encapsulated storage VM or for that matter any OpenSolaris host. Define a dedicated secured user to execute the replication functions. Grant the appropriate permissions to this user to access a cron and ZFS. Assign an RSA Key pair for automated ssh authentication. Define a snapshot replication script using ZFS send/receive calls. Define a cron job to regularly invoke the script. Let define the dedicated replication user. In this example I will use the name zfsadm. First we need to create the zfsadm user on all of our storage VMs. In order to use an RSA key for authentication we must first generate an RSA private/public key pair on the storage head. This is performed using ssh-keygen while logged in as the zfsadm user. You must set the passphrase as blank otherwise the session will prompt for it. Your identification has been saved in /export/home/zfsadm/.ssh/id_rsa. Your public key has been saved in /export/home/zfsadm/.ssh/id_rsa.pub. The id_rsa file should not be exposed outside of this directory as it contains the private key of the pair, only the public key file id_rsa.pub needs to be exported. Now that our key pair is generated we need to append the public portion of the key pair to a file named authorized_keys2. Repeat all the crypto key steps on the target VM as well. We will use the Secure Copy command to place the public key file on the target hosts zfsadm users home directory. It’s very important that the private key is secured properly and it is not necessary to back it up as you can regenerate them if required. Now that we are able to authenticate without a password prompt we need to define the automated replication launch using cron. Rather that using the /etc/cron.allow file to grant permissions to the zfsadm user we are going to use a finer instrument and grant the user access at the user properties level shown here. Keep in mind you can not use both ways simultaneously. Be aware of the timezone the cron service runs under, you should check it and adjust it if required. Here is a example of whats required to set it. Also the default environment path for cron may cause some script “command not found” issues, check for a path and adjust it if required. # Copyright 1991 Sun Microsystems, Inc. All rights reserved. This one has no default path, add the path using echo. The final part of the replication process is a script that will handle the ZFS send/recv invocations. I have written a script in the past that can serve this task with some very minor changes. Here is the link for the modified zfs-daily-rpl.sh replication script you will need to grant exec rights to this file e.g. This script will require that a zpool named sp2 exists on the target system, this is shamefully hard coded in the script. A file containing the file system to replicate and the target are required as well. With any ZFS replicated file system that you wish to invoke on a remote host it is important to remember not make changes to the active replication stream. You must take a clone of this replication stream and this will avoid forcing a complete resend or other replication issues when you wish to test or validate that it’s operating as you expect. Well I hope you found this entry interesting. May 6th, 2010 | Tags: Acceleration, Dedup, Encapsulation, IOMMU, NFS, Storage, VMware, VT-d, zfs. NFS is definitely a very well rounded high performance file storage system and it certainly serves VMware Stores successfully over many storage products. Recently one of my subscribers asked me if there was a reason why my blogs were more centric to iSCSI. Thus the question was probing for a answer to a question many of us ask ourselves. Is NFS superior to block based iSCSI and which one should I choose for VMware. The answer to this question is not which protocol is superior but which protocol serves to provision the features and function you require most effectively. I use both protocols and find they both have desirable capability and functionality and conversely have some negative points as well. NFS typically is generally more accessible because its a file level protocol and sits higher up on the network stack. This makes it very appealing when working with VMware virtual disks aka vmdk’s simply because they also exist at the same layer. NFS is ubiquitous across NAS vendors and can be provisioned by multiple agnostic implementation endpoints. An NFS protocol hosts the capability to be virtualized and encapsulated within any Hypevisor instance either clustered or standalone. The network file locking and share semantics of NFS grant it a multitude of configurable elements which can serve a wide range of applications. In this blog entry we will explore how to implement an NFS share for VMware ESX using OpenSolaris and ZFS. We will also explore a new way of accelerating the servers I/O performance with a new product called the DDRdrive X1. OpenSolaris is an excellent choice for provisioning NFS storage volumes on VMware. It hosts many advanced desirable storage features that set it far ahead of other Unix flavors. We can use the advanced networking features and ZFS including the newly integrated dedup functionality to craft the best NFS functionality available today. Let start by examining the overall NAS storage architecture. In this architecture we are defining a fault tolerant configuration using two physical 1Gbe switches with a quad or dual Ethernet adapter(s). On the OpenSolaris storage head we are using IPMP aka IP Multipathing to establish a single IP address to serve our NFS store endpoint. A single IP is more appropriate for VMware environments as they do not support multiple NFS IP targets per NFS mount point. IPMP provisions layer 3 load balancing and interface fault tolerance. IPMP commonly uses ICMP and default routes to determine interface failure states thus it well suited for a NAS protocol service layer. In a effort to reduce excessive ICMP rates we will aggregate the two dual interfaces into a single channel connection to each switch. This will allow us to define two test IP addresses for the IPMP service and keep our logical interface count down to a minimum. We are also defining a 2 port trunk/aggregate between the two physical switches which provides more path availability and reduces switch failure detection times. On the ESX host side we are defining 1 interface per switch. This type of configuration requires that only one of the VMware interfaces is an active team member vmnic within a single vSwitch definition. If this is not configured this way the ESX host will fail to detect and activate the second nic under some failure modes. This is not a bandwidth constraint issue since the vmkernel IP interface will only activity use one nic. With an architecture set in place let now explore some of the pros and cons of running VMware on Opensolaris NFS. VMware uses NFS in a thin provisioned format. VMDKs are stored as files and are mountable over a variety of hosts. IP based transports can be virtualized and encapsulated for disaster recovery. ZFS retains NFS share properties within the ZFS filesystem. ZFS will dedup VMDKs files at the block level. Every write I/O from VMware is an O_SYNC write. Limited in its application. Only NFS clients can consume NFS file systems. Before we break out into the configuration detail level lets examine some of the VMware and NFS behaviors so as to gain some insight into the reason I primarily use iSCSI for most VMware implementations. I would like demonstrate some characteristics that are primarily a VMware client side behavior and it’s important that you are aware of them when your considering NFS as a Datastore. This VMware performance chart of an IOMeter generated load reveals the burst nature of the NFS protocol. The VMware NFS client exclusively uses a O_SYNC flag on write operations which requires a committed response for the NFS server. At some point the storage system will not be able to complete every request and thus a pause in transmission will occur. The same occurs on reads when the network component buffers reach saturation. In this example chart we are observing a single 1Gbe interface at saturation from a read stream. In this output we are observing a read stream across vh0 which is one of two active ESX4 host VMs loading our OpenSolaris NFS store and we can see the maximum network throughput is achieved which is ~81MB/s. If you examine the average value of 78MB/s you can see the burst events do not have significant impact and is not a bandwidth concern with ~3MB/s of loss. At the same time we are recording this write stream chart on vh3 a second ESX 4 host loading the same NFS OpenSolaris store. As I would expect, its very similar to the read stream except that we can see the write performance is lower and that’s to be expected with any write operations. We can also identify that we are using a full duplex path transmission across to our OpenSolaris NFS host since vh0 is reading (recieving) and vh3 is writing(transmitting). In this chart we are observing a limiting characteristic of the VMware vmkernel NFS client process. We have introduced a read stream in combination with a preexisting active write stream on a single ESX host. As you can see the transmit and receive packet rates are both reduced and now sum to a maximum of ~75MB/s. Transitioning from read to write active streams confirms the transmission is limited to ~75Mb/s regardless the full duplex interface capability. This information demonstrates that a host using 1Gbe ethernet connections will be constrained based on its available resources. This is a important element to consider when using NFS as a VMware datastore. Another important element to consider is the CPU load impact of running the vmkernel NFS client. There is a significant CPU cycle cost on VMware hosts and this is very apparent under heavier loads. The following screen shot depicts a running IOmeter load test against our OpenSolaris NFS store. The important elements are as follows. IOMeter is performing 32KB reads in a 100% sequential access mode which drives a CPU load on the VM of ~35% however this is not the only CPU activity that occurs for this VM. When we examine the ESX host resource summary for the running VM we can now observe the resulting overhead load which is realized by viewing the Consumed Host CPU value. The VM in this case is granted 2 CPUs each are a 3.2Ghz Intel hypervisor resource. We can see that the ESX host is running at 6.6Ghz to drive the vmkernel NFS I/O load. Lets see the performance chart results when we svMotion the activily loaded running VM on the same ESX host to an iSCSI VMFS based store on the same OpenSolaris storage host. The only elements changing in this test are the underlying storage protocols. Here we can clearly see CPU object 0 is the ESX host CPU load. During the svMotion activity we begin to see some I/O drop off due to the addition background disk load. Finally we observe the VM transition at the idle point and the resultant CPU load of iSCSI I/O impact. We clearly see the ESX host CPU load drop from 6.6Ghz to 3.5Ghz which makes it very apparent the NFS requires substantially higher CPU that iSCSI. With the svMotion completed we now observe the same IOMeter screen shot retake and its very obvious that our throughput and IOPS have increased significantly and the VM granted CPU load has not changed significantly. A decrease of ESX host CPU load in the order of ~55% and and increase of ~32% in IOPS and 45% of throughput shows us there are some negative behaviors to be cognizant of. Keep in mind that this is not that case when the I/O type is small and random like that of a Database in those cases NFS is normally the winner, however VMware normally hosts mixed loads and thus we need to consider this negative effect at design time and when targeting VM I/O characteristics. As a very special treat on this configuration I am also privileged to run an DDRDrive X1 Cache Accelerator which I am currently testing some newly developed beta drivers for OpenSoalris. Normally I would use 4GB of ram as a minimum but I needed to constraint this build in a effort to load down the dedicated X1 LOG drive and the physical SATA disks thus this instance is running only 2GB of ram. In this blog entry I will not be detailing the OpenSolaris install process, we will begin from a Live CD installed OS. To establish an aggregation we need to un-configure any interfaces that we previously configured before proceeding. Here we have set the policy allowing layer 2 and 3 and defined two aggregates aggr1 and aggr2. We can now define the VLAN based interface shown here as VLAN 500 instances 1 are 2 respective of the aggr instances. You just need to apply the following formula for defining the VLAN interface. Each pair of interfaces needs to be attached to a trunk definition on its switch path. Typically this will be a Cisco or HP switch in most environments. Here is a sample of how to configure each brand. Once we have our two physical aggregates setup we can define the IP multipathing interface components. As a best practice we should define the IP addresses in our hosts file and then refer to those names in the remaining configuration tasks. Here we have named the IPMP data interface aka a public IP as uss1.esan-data1 this ip will be the active connection for our VMware storage consumers. The other two named uss1.esan-ipmpt1 and uss1.esan-ipmpt2 are beacon probe IP test addresses and will not be available to external connections. IPMP functionallity is included with OpenSolaris and is configured with the ifconfig utility. The follow sets up the first aggregate with a real public IP and a test address. The deprecated keyword defines the IP as a test address and the failover keyword defines if the IP can be moved in the event of interface failure. To persist the IPMP network configuration on boot you will need to create hostname files matching the interface names with the IPMP configuration statement store in them. The following will address it. In order for IPMP to detect failures in this configuration you will need to define target probe addresses for IPMP use. For example I use multiple ESX hosts as probe target on the storage network. 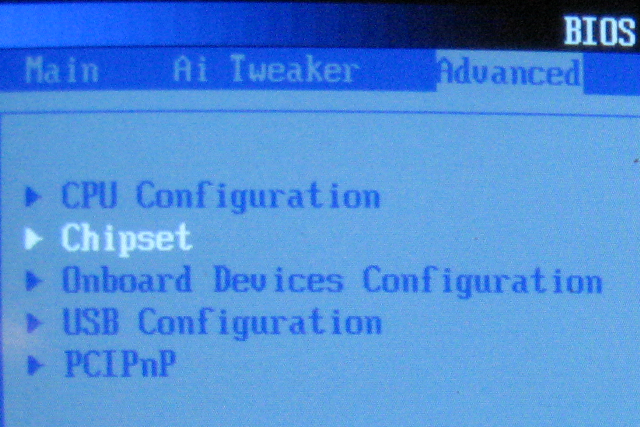 This network configuration yields 2,2Gbe aggregate paths bound to a single logical active IP address on 10.1.0.1, with interfaces aggr1 and aggr2 the keyword deprecated directs the IPMP mpathd service daemon to prevent application session connection packets establishment and the nofailover keyword instructs mpathd not to allow the bound IP to failover to any other interface in the IPMP group. There are many other possible configurations but I prefer this method because it remains logically easy to diagnose and does not introduce unnecessary complexity. Now that we have layer 3 network connectivity we should establish the other essential OpenSolaris static TCP/IP configuration elements. We need to ensure we have a persistent default gateway and our DNS client resolution enabled. The persistent default gateway is very simple to define as is done with the route utility command as follows. You can also use the static /etc/hosts file to define any resolvable name to IP mapping. With OpenSolaris you should always define your NFS share properties using the ZFS administrative tools. When this method is used we can the take advantage of keeping the NFS share properties inside of ZFS. This is really useful when you replicate or clone the ZFS file system to an alternate host as all the share properties will be retained. Here are the basic elements of an NFS share configuration for use on VMware storage consumers. The ACL NFS share property of rw sets the entire share as read write, you could alternately use rw=hostname for each host but it seems redundant to me. The nosuid prevents any incoming connection from switching user ids for example from a non-root value to 0. Finally the root=hostname property grants the incoming host name access to the share with root access permissions. Any files created by the host will be as the root id. While these steps are some level of access control it falls well short of secure thus I also keep the NAS subnets fully isolated or firewalled to prevent external network access to the NFS share hosts. Once our NFS share is up and running we can proceed to configure the VMware network components and share connection properties. VMware requires a vmkernel network interface definition to provision NFS connectivity. You should dedicate a vmnic team and a vswitch for your storage network. As you can see we have dedicated the vSwitch and vmnics on VLAN 500, no other traffic should be permitted on this network. You should also set the default vmkernel gateway to its own address. This will promote better performance as there is no need to leave this network. For eNAS-Interface1 you should define one active and one standby vmnic. This will ensure proper interface fail-over in all failure modes. The VMware NFS kernel instance will only use a single vmnic so your not loosing any bandwidth. The vmnic team only serves as a fault tolerant connection and is not a load balanced configuration. At this point you should validate your network connectivity by pinging the vmkernel IP address from the OpenSolaris host. If you chose to ping from ESX use vmkping instead of ping otherwise you will not get a response. Provided your network connectivity is good you can define your vmkernel NFS share properties. Here is a visual example. In this example we are using a DNS based name of uss1-nas. This would allow you to change the host IP without having to reconfigure VMware hosts. You will want to make sure the DNS name cache TTL in not a small value for two reasons. One an DNS outage would impact the IP resolution and as well you do not want excessive resolution traffic on the eSAN subnet(s). The NFS share configuration info is maintained in the /etc/vmware/esx.conf file and looks like the following example. You will need to reboot the ESX server to clean it up so don’t mess with anything else until that is performed. (I’ve wasted a few hours on that buggy VMware kernel NFS client behavior). Once the preceeding steps are successful the result will be a NAS based NFS share which is now available like this example. With a working NFS storage system we can now look at optimizing the I/O capability of ZFS and NFS. VMware performs write operations over NFS using an O_SYNC control flag. This will force the storage system to commit all write operations to disk to ensure VM file integrity. This can be very expensive when it comes to high performance IOPS especially when using SATA architecture. We could disable our ZIL aka ZFS Intent Log but this could result in severe corruption in the event of a systems fault or environmental issue. A much better alternative is to use a non-volatile ZIL device. In this case we have an DDRdrive X1 which is a 4GB high speed externally powered dram bank with a high speed SCSI interface and also hosts 4GB of flash for long term shutdowns. The DDRdrive X1 IO capability reaches the 200,000/sec range and up. By using an external UPS power source we can economically prevent ZFS corruption and reap the high speed benefits of dram even when unexpected system interruptions occur. In this blog our storage host is using Seagate ST3500320AS disk which are challenged to achieve ~180 IOPS. And that IO rate is under ideal sequential read write loads. With a cache we can expect that these disks will deliver no greater than 360 IOPS under ideal conditions. No lets run the SQLIO test for 5 minutes with random 8K I/O write requests which are simply brutal for any SATA disk to keep up with. We have defined a file size of 32GB to ensure we hit the disk by exceeding our 2GB cache memory foot print. As you can see from the output we achieve 227 IOs/sec which is below the mirrored drive pair capability. Now lets enable the DDRdrive X1 ZIL cache and see where that takes us. Again we run the identical SQLIO test and results are dramatically different, we immediately see a 4X improvement in IOPS but whats much more important is the reduction in latency which will make any database workload fly. When we look at ZFS ZIL caching devices there are some important elements to consider. For most provisioned VMware storage systems you do not require large volumes of ZIL cache to generate good I/O performance. What you need to do is carefully determine the active data write footprint size. Remember that ZIL is a write only world and that those writes will be relocated to a slower disk at some point. These relocation functions are processed in batches or as Ben Rockwood likes to say in a regular breathing cycle. This means that random I/O operations can queued up and converted to a more sequential like behavior characteristic. Random synchronous write operations can be safely acknowledged immediately and then the ZFS DMU can process them more efficiently in the background. This means that if we provision cache devices that are closer to the system bus and have lower latency the back end core compute hardware will be able to move the data ahead of the bursting I/O peak up ramps and thus we deliver higher IOPS with significantly less cache requirements. Devices like the DDRdrive X1 are a good example of implementing this strategy. I hope you found this blog entry to be interesting and useful. February 14th, 2010 | Tags: aggregate, cache, Dedup, NFS, performance, VMware, zfs, ZIL.